Louisa May Alcott's 150-year old novel Little Women is experiencing a bit of a resurgence at the moment. A beautiful mini-series came out recently on Masterpiece, a modern adaptation is set to be released to movie theaters this fall, and director/writer Greta Gerwig's star-studded movie is currently in pre-production. #TCTheater is also getting in on the action; Jungle Theater has commissioned a new theatrical adaptation from Kate Hamill (who recently adapted Sense and Sensibility, seen on the Guthrie stage two years ago). There's a reason Alcott's semi-autobiographical novel has remained so popular. This story of four very different sisters who support each other despite their differences, and each struggle to find their own path in life, is timeless and always inspirational. 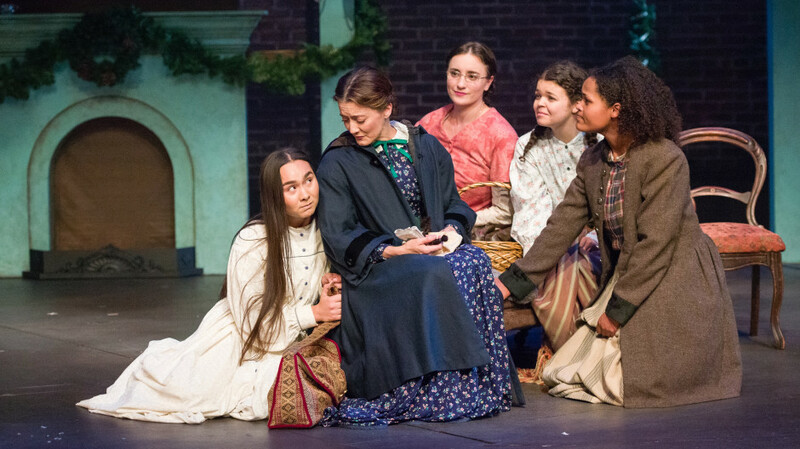 This lively adaptation (that stops short of the end of the book), featuring a wonderful and diverse cast, is sweet and heart-warming, staying true to the source but casting the story in a more modern and relevant light. It's been decades since I read the novel, but I did watch the recent mini-series so the story is somewhat fresh in my mind. This adaptation includes most of the moments and characters we know and love, if in a bit of a compressed form. And as I mentioned, the story stops before Jo goes off to the big city and Amy goes to Europe. But that seems appropriate and keeps the play at a briskly moving two hours. Appropriate because each little woman has her complete arc - Meg (Christine Weber) finding herself again after motherhood, Amy (Megan Burns) growing up (a little) and making amends with her sisters, Jo (C. Michael Menge) finding her voice and finally writing a "real" story, and Beth (Isabella Star LaBlanc) ... well we know how her arc ends #bringtissues. The four sisters really are the centerpiece of the story, around which revolve several other characters including their beloved Marmie (Christina Baldwin), trusty maid/cook/second mother Hannah (Wendy Lehr), their mostly absent father (Tyson Forbes), charming neighbor boy Laurie (Michael Hanna), his stern but tender-hearted grandfather (Jim Lichtscheidl), and Meg's suitor John (James Rodriguez). Under Sarah Rasmussen's dynamic direction (and Jim Lichtsheidl's movement choreography), characters float on and off stage in a most charming and entertaining way. The play begins and ends with everyone on stage, and the story is framed through Beth asking Jo - tell me a story, a real one! Scenes flow quickly from one to the next, often accompanied by recorded and live music - piano played by Isabella Star LaBlanc and Michael Hanna, and fiddle played by Tyson Forbes as he wanders in and out of scenes (as I kind of wish he would through every play I see). Most of the action takes place in the March home, sparsely represented on the Jungle stage with the back wall open to the back of the theater. This is to allow for a rotating circle on the floor that delivers scenery and adds to the movement of the play. Characters are dressed in period clothing that's neat but not fancy, with few costume changes, which points to their life lived in "genteel poverty," as Wikipedia puts it. There are many moving pieces in this play, literally and figuratively, and they all come together beautifully. (Sound design by Sean Healey, music composition by Robert Elhai, set design by Chelsea M. Warren, and costume design by Rebecca Bernstein). This adaptation puts more emphasis on the strict gender roles of the time (which are different today, but often still strictly defined), and the way that Jo, and even Laurie, don't fit in them. This idea was always there in Alcott's story, but we see it in a new light now with our increased understanding of the fluidity of gender identity and the many different ways there are to be a woman, little or otherwise. This would be a great play to bring kids to, but it's entertaining for people of all ages - fresh and fun and heartfelt. It's a sweet and wholesome story about family and individuality, and the struggle between those two, as well as finding your voice and finding your place in the world. Which is something we can all relate to. 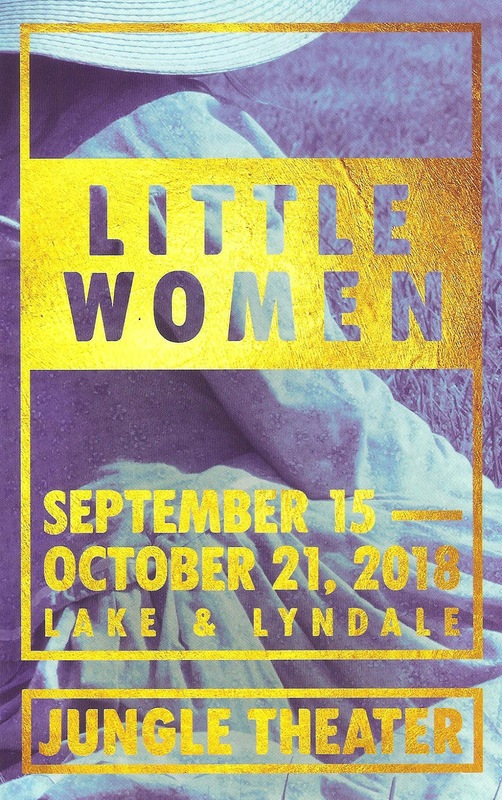 Little Women continues at the Jungle Theater in Uptown through October 21 (I recommend going on a weekday to avoid the weekend Uptown crowds and traffic).